Joseph Beverley Starr Lieutenant Carleton and York Regiment, R.C.I.C. July 18, 1918 Halifax, NS September 2, 1941 Fredericton, NB Hartland, NB 23 5 feet, 8¾ inches dark brown brown Bank Clerk (Bank of Montreal) Church of England Single Helen Keefer Starr (Mother) Wolfville, Kings Co., NS July 18, 1943 25 Agira Canadian War Cemetery, Sicily Plot A, Row B, Grave 25 Commemorated on Page 216 of the Second World War Book of Remembrance Displayed in the Memorial Chamber of the Peace Tower in Ottawa on May 8 Joseph Starr was the son of William Henry Chipman Starr (1876-1928) and Helen Naomi (Keefer) Starr. Lieutenant Starr attended King’s College at Windsor for six years. He received his senior matriculation in 1934 at the age of fifteen. He entered the Bank of Montreal at Wolfville, NS on completion of his studies in 1934. He had many and varied interests, including tennis, hunting, fishing and sailing, and was ardent chess player. At school he was a member of the Cadet Corps and at Wolfville, a Troop Leader in Boy Scouts. He was transferred to the Bank of Montreal in Hartland, New Brunswick and there joined the 2nd Battalion Carleton and York Regiment. In September 1941 he enlisted for active service and was selected as officer material. He proceeded to Brockville, Ontario where he received his commission. 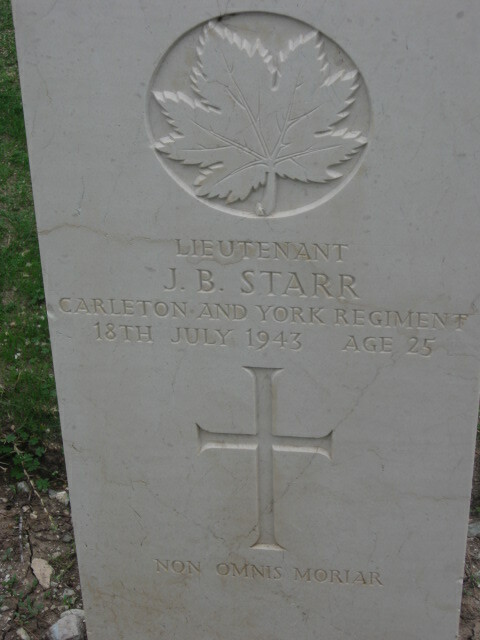 Lieutenant Starr embarked Canada in September 1942 and disembarked in England on October 8, 1942. While in England he served as a Transport Officer with the Canadian Forces on the southern coast. He then proceed to the Mediterranean area with the 1st Division and took part as a Platoon Commander, in the heavy fighting in Sicily. He was killed in action during the invasion of Sicily when his unit was pinned down by enemy machine gun fire. While crawling forward in an attempt to silence the enemy fire he was hit and killed.